Rosie, the pig, and Beyoncé both sit still, awaiting a treat from their owners, Lis and Jordan Frentress. Lis and Jordan Frentress’ pet, Rosie, lacks manners. When marching across the kitchen floor, she’ll stomp her pointed hooves on people’s feet, knocking over objects along the way. A triple-locked childproof latch for the garbage bin protects her favorite fixation (garbage), but you can’t blame her for honoring her natural instincts. After all, she’s a pig. Rosie is a Vietnamese potbelly pig. The Frentresses had no intention of adopting a pig, but as Lis skimmed an online swap site featuring a teacup pig, it piqued her interest. Lis messaged the person who was selling the pig, but Jordan wasn’t thrilled with the idea. They declined. 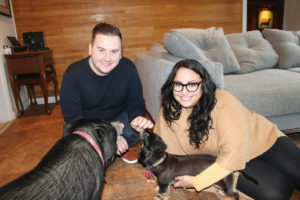 A few weeks later, the owner reached out to Lis again, offering to give the pig away. They learned the owner was a teenager who hid the pig from her parents and fed it guinea pig food. Once her parents found out, she was forced to give it away. Since Rosie’s arrival, the couple has grown to love her, although the “clueless” pig lacked manners and needed to be socialized. They’ve potty trained her. When they ring a bell or crinkle a plastic sack, she comes running and hops outside. Their dog, Beyonce, gets along OK, as long as Beyonce is boss. The two pets often vie for their parents’ attention. If Rosie gets in trouble for trashing the garbage, Beyonce cowers and runs away, as if she’s the scolded one. Surprisingly, Rosie displays pet-like qualities. She jumps up on the 2-foot-high bed. When Jordan commands “sit,” Rosie remains still for a treat. Rosie’s biggest motivation tool is food. However, the couple watches her food intake so she doesn’t get too big. Some potbelly pigs can weigh up to 200 pounds, whereas Rosie tips the scales at 70. They feed her a vegetarian diet (no bacon!) and avoid feeding her trash or leftovers. Rosie sleeps in her own bed and gives “snout” kisses to Jordan and Lis. Both like the uniqueness of owning a pig.